First comes the cold weather. Then comes your new first-person-viewpoint snowboarding action movie. This sequence of events brought to you by Antix, an artificially intelligent action film editor for your next stunt reel, now available for Android (iPhone’s not far behind). 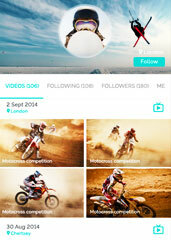 This app lets you have more fun filming with your GoPro with less time spent editing out all the boring stuff. That’s what this app lets you do. See, inside it is a tiny Warren Miller. That, or they’re just employing really sophisticated algorithms that kind of think like him. Point is: it can automatically detect the best parts of your adventure sports hijinks and edit them into little Vine-like snippets that will be uploaded to social networks, tagged with your location and assigned points based on things like level of difficulty and virality. You can have that one.